This vision means the role of the customer is changing: from recipient to both user and provider of electricity and other grid services. By investing in clean, distributed energy resources, customers can make the electric system more efficient and contribute to a cleaner environment, while gaining greater control over their energy bills. As part of REV, the Commission is now considering how to compensate distributed energy resources for all the benefits they provide to the electric system and society at large. These benefits vary by time and location, which should be taken into account when deciding how to compensate customers who contribute to the grid. Doing so will help reduce system costs and pollution. 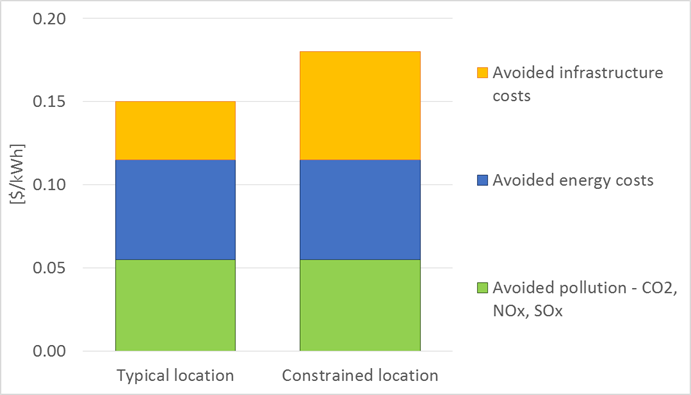 Broadly, these time- and location-specific benefits can be classified into three main categories: avoided energy, infrastructure, and emissions costs. Let’s use a rooftop solar system to examine how these benefits might play out. By generating electricity on-site, rooftop solar makes it possible for the customer to buy less electricity from a utility. Furthermore, because this electricity is generated locally and does not have to be transmitted hundreds of miles from the power plant to the customer, energy losses that happen along the way can be avoided. This means less electricity needs to be generated by large-scale power plants, and the costs of generating that electricity can be avoided. The amount of avoided energy costs, however, depends on when the solar system generates its electricity and where on the grid it is located because these factors determine what kind of generation – coal, natural gas, renewables, etc. – would otherwise serve that customer. For example, if the solar system generates electricity at a place and time when a natural gas generator would have otherwise supplied that electricity, the cost savings are greater than if the solar power would substitute for another renewable energy source, such as a wind farm. By reducing demand for utility-provided electricity, the rooftop solar system cuts down on the amount of costly infrastructure necessary for the generation, transmission, and distribution of electricity. At any point in time, power plants need sufficient capacity to meet the electricity demand from all customers. This also requires transmission and distribution infrastructure to deliver that electricity to the customers’ homes and businesses. If customers require less electricity from central power plants because they install a rooftop solar system, less investment in generation, transmission, and distribution capacity is needed, and related costs can be reduced. Time- and location-specific benefits can be classified into three main categories: avoided energy, infrastructure, and emissions costs. Just as with avoided energy costs, the amount of avoided infrastructure costs depends on when and where the solar panel is generating electricity, which is most valuable at times and locations where the grid is close to reaching capacity. By reducing demand for power plant-generated electricity, the rooftop solar panel also helps avoid emissions coming from those plants. As with avoided energy and infrastructure costs, the time and location at which the solar panel generates its electricity determines the amount of avoided emissions. During times and in locations where electricity demand is high and fossil fuel-fired power plants are in operation, clean electricity from rooftop solar can serve as a substitute, avoiding harmful emissions like carbon dioxide, nitrogen oxide, and sulfur oxide. All of these avoided costs have value in the form of environmental and electric system benefits. Specifically, one study (see figure below) suggests that we can value a unit of electricity (kilowatt-hour) generated by a rooftop solar system at, on average, 15 cents per kilowatt-hour in New York. But, because the avoided infrastructure costs vary across different locations, this value is much higher for solar systems installed in places on the grid where transmission and distribution infrastructure is constrained. For example, in New York City, parts of Brooklyn and Queens are seeing unprecedented growth in electricity demand, and Con Edison is struggling to serve them because the utility’s distribution infrastructure is reaching capacity. A new rooftop solar system installed in those neighborhoods might have more value to the overall electric system versus a similar solar array installed in Manhattan. This would mean the rooftop solar owner in Brooklyn or Queens should get compensated more per kilowatt-hour of solar she produces. However, the way New York’s electricity rates are currently structured, these locational factors are not taken into consideration. This is a huge missed opportunity for the environment, as well as for electric rate payers who end up paying for utility infrastructure upgrades. In Environmental Defense Fund’s comments to the REV proceedings, we continue to advocate for compensation that fully captures the value of all energy, infrastructure, and environmental benefits provided by clean, distributed energy resources, and in a manner that reflects how these benefits vary by time and location. This way, customers who want to invest in these clean energy solutions will be fairly compensated for doing so and be able to save money, while at the same time, reducing system-wide costs and helping the environment. This entry was posted in Energy efficiency. Bookmark the permalink. Post a comment or leave a trackback: Trackback URL. Good read and Great article.The solar power is the perfect solution for the future.The use of solar power can control the level of pollution, as the process of generating electricity from sunlight cause no pollutants. Great post.The solar power is the safest and cleanest energy and helps us sustain the environment.Unlike the non-renewable energy sources, such as coal and petroleum, solar power does not smog or global warming.I’m very happy that I choose to go with solar panel, solar is the thing for the future, the sun is free we should use it. 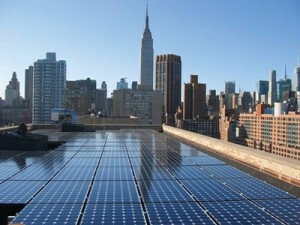 We all know that New York is the cleanest city and by solar rooftop, we can make it heaven. Thanks a lot for writing this blog.